Most equate Adam and Eve as the first man and woman whose sin led to the introduction of the curse of sin. However, they are also the first family model that is spoken of in scripture. We are told, that because of the fall, they would have to labor to produce food and that Eve would suffer pain in childbirth. All of these factors are still true today. The birth of Cain and Able and their subsequent conflict which leads to Able’s death is also an example of sibling rivalry that can be seen in some families today. We are not told about the affect of Able’s murder by his brother on Adam and Eve but one may surmise that they would be as devastated as any parents today would have been. They were an example of a family facing the same challenges and struggles that families do, at least on some level, today. It's obvious that Adam and Eve did not have Dr. Benjamin Spock's book, "Baby and Child Care", book written in the 1950's to guide them in parenting Cain and Able. Today the market is flooded with "How To's" to parenting successfully. Studies dating back to the mid 1800's give trends to healthy parenting with theories such as, "you should position your child with its head pointing due north to keep the great electrical currents from affecting the child", "Pregnant mothers should never think of ugly people or anyone marked with any deformity or disease. The unborn child is affected by the thoughts and the surroundings of the mother." These trends were written by men who claimed to possess scientific knowledge as to how to have healthy children. Advice from how to handle the child, the number of bowel movement the new born must have, and as for "crying", every expert agreed, "let them cry". A spoiled baby will be miserable it's entire life and the worst way to spoil the baby is to hold it when it cry's. Modern Day Trends say that Crying means "I'm hungry," "I need my diaper changed," "I want to be held." Newborns eat 8 - 12 times a day and you should change at least 4 wet diapers and one or more "others" a day. You should plan "play dates" with your toddler because this helps the child to build bonds with people outside the family. One can find articles with topics such as, "What to do when "no" doesn't always work," "How to handle a Temper Tantrum," "How to Teach your Pre-Schooler to Share," "6 Ways to Stop Sibling Fighting," and the list goes on. Bet Adam and Eve would have down loaded that article. Fast forward to the story of Noah and his family and we learn that his family was protected from the flood because of Noah’s relationship with God. We read in Genesis 6:9 that “These are the descendants of Noah. Noah was a righteous man, blameless in his generation; Noah walked with God.” While we can no doubt say this family model had to have some stability to remain together in a boat full of animals for months and months, we can not overlook the subsequent controversy regarding the curse of Ham, Noah’s son, by Noah. Something went awry in the midst of Noah’s drunkenness. Why would one son shame his father by “seeing” his nakedness and then telling his brothers about it, while the other two brothers would very intentionally avoid “seeing” their father in a naked state and cover him to prevent others from witnessing him? What conflict existed between Ham and Noah that would lead to the cursing of an entire nation (Canaan)? 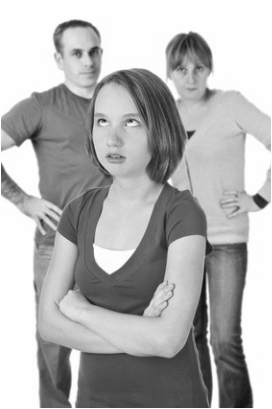 Again, we can see elements of child/parent issues that still exist in families today. In an article published by Psychology and Aging, Vol 24(2), Jun 2009, stated, "Tensions are normative in the parent and adult child relationship, but there is little research on the topics that cause the most tension or whether tensions are associated with overall relationship quality. Adult sons and daughters, aged 22 to 49, and their mothers and fathers (N = 158 families, 474 individuals) reported the intensity of different tension topics and relationship quality (solidarity and ambivalence) with one another. Tensions varied between and within families by generation, gender and age of offspring. In comparison to tensions regarding individual issues, tensions regarding the relationship were associated with lower affective solidarity and greater ambivalence. Findings are consistent with the developmental schism hypothesis, which indicates that parent-child tensions are common and are the result of discrepancies in developmental needs which vary by generation, gender, and age." This article report that tensions occur even long after children are grown. It is also inconclusive as to whether the tensions are associated with the relationship quality. Tensions may reflect either the parameters of the relationship or the behaviors of one of the individuals in the relationship. The individual tensions in this study may reflect parents' worries and irritations regarding their children's progress as adults. The trends facing families today would not be much different from Noah's day. I can only imagine the stress he encountered being locked up with all the responsibilities of caring for the animals alone, but to keep the family at peace following this event must have been great. Consider the story of Abraham and Sarah.. Abraham is regarded as the “Father of our Faith” so one might surmise that his family model would represent an example for families today. Though Abraham was certainly a man that listened to and lived by the Word of the Lord, he unfortunately did not always make the right decisions. 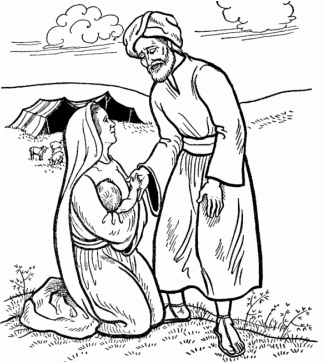 Abraham took his sister, Sarah, as a wife but twice denounced her as his wife. When he could not have a child with her as promised by God, he accepted the gift of his wife’s maid servant and bore a son through her. However this was not who God had intended to be his son. God delays fulfillment of the promise until Abraham and Sarah are in their old age, beyond child bearing years, to allow Isaac to be born. Then, after the miracle of Isaac’s birth, God asks Abraham to sacrifice his son. There is no discussion in the Biblical text regarding Abraham’s inner conflict that surely must have raged regarding obedience to God and his love for his son. There is also no discussion of Sarah’s reaction to all of this as Scripture sometimes does not elaborate on what must have been some very obvious complications in this family. From the moment Abraham leaves the mountain to sacrifice Isaac, we cannot find that he and Sarah ever re-unite. Upon her death we see him traveling to bury her. Did Sarah leave him because of what had occurred with Isaac? Did Abraham leave Sarah? We are not told the essence of the story but there was no doubt a devastating familial outcome due to this event. Without knowing everything that transpired between Abraham, Sarah and Isaac after the trip to the mountain, it is impossible to know the nature of the impact on their family. Reports are now coming out that the divorce rate in the US is not the what was claimed to be 50% of all marriages. Some research shows that the divorce rate is actually decreasing instead of increasing. This may be true but there are several factors contributing to the lower divorce rates. Co-habitation is the new buzz word trending among couples. According to some research, living together seems to be more accepted today causing people to have less incentive to make the commitment to marriage. "Conscious Uncoupling" is the new trending alternative to divorce. Conscious uncoupling involves a couple looking to separate with the least amount of emotional damage possible. This new-age lifestyle idea with the definition as being the ability to understand that every irritation and argument was a signal to look inside ourselves and identify a negative internal object that needs healing. From this perspective, there are no bad guys, just two people. Although conscious uncoupling has no legally binding aspects, it's making the headlines especially among celebrities. Wonder if Sarah and Abraham entered into a conscious uncoupling, if indeed they were never together again? Divorce, Separation, Martial problems has alway been a factor but what has really happened to the word Covenant? Till death do up part? As long as we both shall live? Reports have shown that nearly half (44%) of young people ages 18 to 29 have a step sibling. In contrast, about half as many (23%) of those ages 50 to 64—and just 16% of those 65 or older—have a step sibling. This, of course, is due to the high divorce rate in this country but it is also a signal that even though divorce is common, re-marriage is just as common. In fact, statistics demonstrate that almost 75% of all individuals who divorce, eventually remarry. However, blended families find life can be more complex than they ever imagined with complicated schedules, squabbling stepsiblings, issues with ex-partners, and new spouses who've never been parents trying out childcare adding to the challenges of everyday life. 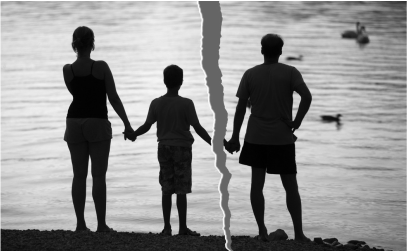 Some families are able to successfully navigate these issues, however the divorce rate among blended families are actually show to be around 67%, which is actually higher than for first time marriages. It is a sad reminder that what worked for The Brady Bunch does not always work in reality. In the New Testament we find an interesting example of family as demonstrated by the relationship between Jesus and his disciples. They were together for three years day in and day out. Their relationship, though not what we would define as a nuclear family by today's standards, certainly provide a familial example and displays the deep bond that can exist between those who live together and who do life together. Families today do not always look like our predisposed notion of family with a mother, father, two kids and a family pet. Families are made up of a group of people whose interrelationships with one another form a bond that can only be developed by individuals who experience life together. Maybe a family could be formed by a covenant with God where un-conditional love is on display. In other words, maybe the formation of a biblical family is not just viewed only as a clan or single unit of people, but a better picture of family might be a picture of what the “Church” should and will look like. The book of Acts describes how the early church came together in such an interconnected way that they responded to one another's needs and made sure everyone was taken care of. The concern was for the welfare of the entire group. Love was extended to all. Grace for failures and forgiveness for mistakes were common themes. They were in the truest sense of the word, a family. Perhaps if society rethinks family along these lines, some of the trends that have been mentioned above might become a little more positive and a little less troubling.